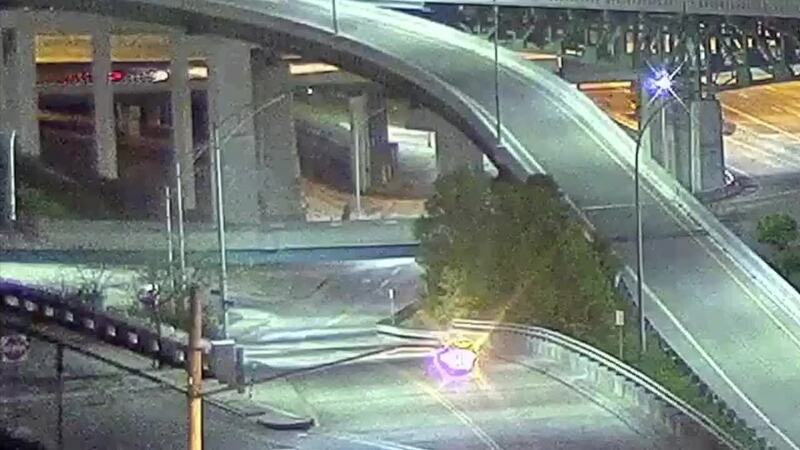 CINCINNATI -- Excessive speed is a factor in the crash that sent a semi off the Interstate 471 overpass in Mount Adams early Wednesday morning, according to the Cincinnati Police Department. Two people, the 53-year-old male driver and a 55-year-old female passenger, were hurt. The semi rolled off the overpass from northbound I-471 to 3rd Street just before 3 a.m. and landed upside down on Monastery Street at the bottom of Mount Adams. The vehicle fell about 30 feet, police said. Southbound Monastery Street reopened at about 2:30 p.m. Northbound remains closed. 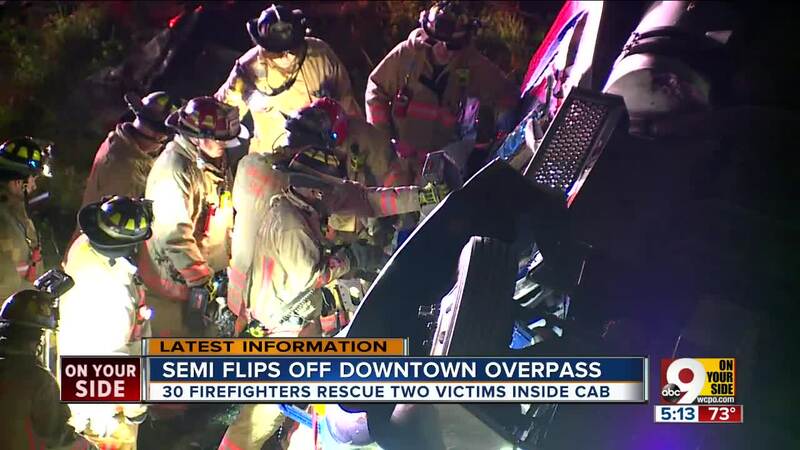 About 30 firefighters worked for almost an hour to rescue the two people trapped in the cab. First responders transported the victims to a hospital. Police said the driver has serious injuries. The passenger, who was sleeping in the truck's sleeper berth, sustained minor injuries. The semi was hauling gravel and large pieces of metal equipment. 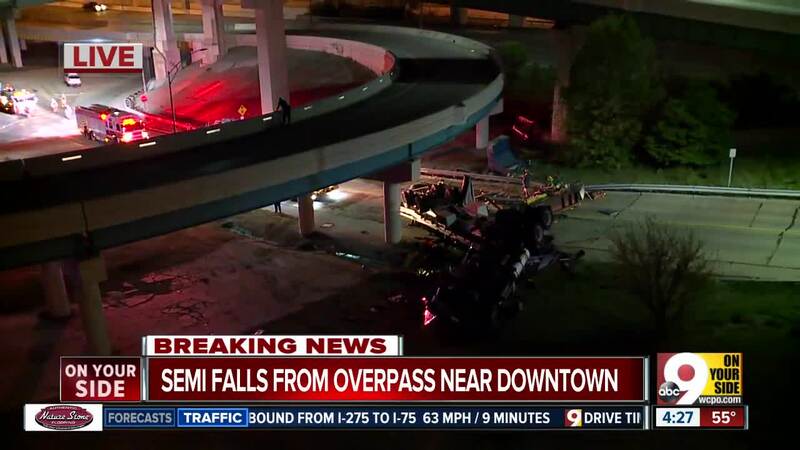 Police said the driver failed to negotiate the curve. Impairment was not a factor, police said. The Ohio Department of Transportation is also inspecting the overpass to make sure it wasn't damaged. 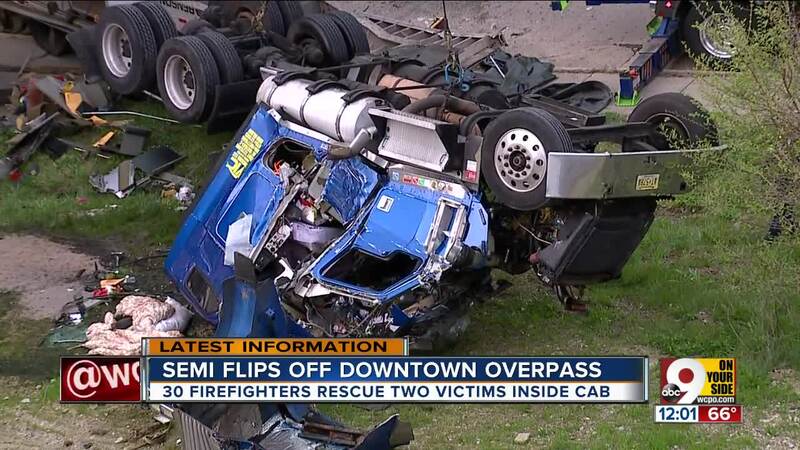 A similar accident sent a semi careening over the same edge back in October 2006.